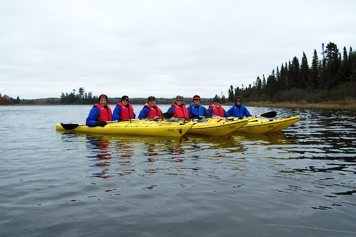 Hello Jeff & Sarah, thought you might like a picture of four satisfied customers just returned from the BWCA. Hello, I just wanted to thank you folks for your services over the past weekend. The gear we rented from Sawtooth was first rate, and we enjoyed a great vacation thanks to all of you. 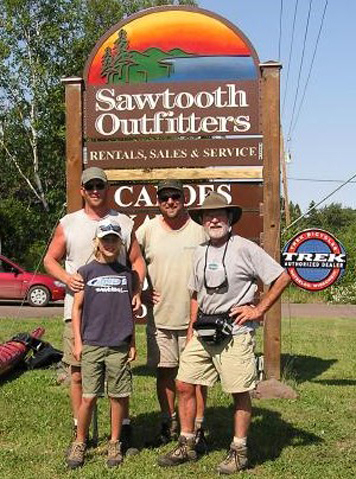 We will definitely recommend Sawtooth Outfitters to our friends and relatives who happen to be headed up to the BWCAW, and I’m sure we’ll use you again in the future as well. Thanks again, and best regards! Hello Sarah & Jeff, thank you very much for your help. We had a great time, regardless of the wind and rain (I expect rain each time I go, and if I get sun, all the better), and the canoes and packs were fantastic. 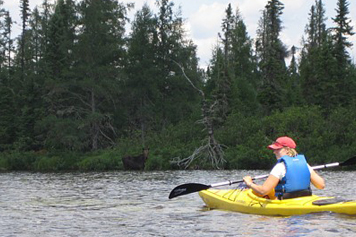 Having a reliable pack makes the portages easier and having reliable canoes is obviously a necessity. Thank you for being patient with us. I hope you have a successful rest of the season. Thank you. Hi Sarah & Jeff, thanks again for the wonderful kayak adventure on Saturday! We all had such a great time! We look forward to working with you again next year! Hi, my fiancé Andrea and I rented kayaks from you on July 3rd. We went to Fourmile Lake and paddled for 2 1/2 hours. On the south side of the lake we encountered our first moose (well, my first moose anyway). After watching from afar for a few minutes we were amazed to see a baby calf walk up to the shoreline. Unbelievable! We watched in awe for about 5 minutes before they both retreated inland. It was a great experience.